We spent 3 weeks in India. Find out how much we spent! India was our 5th stop on our round-the-world adventure back in March 2012 and a much needed break for our wallets after New Zealand and Australia. After much debate, we decided to omit Mumbai, Goa and Varanasi to spent exactly three weeks in the Rajasthan region of India. It was definitely the right decision because India is big, and three weeks is barely enough time to get to know one region let alone the entire country. We braved the Indian railways and was surprised to find it easy to navigate and comfortable.. for the most part minus a few roaches and the occasional mouse. 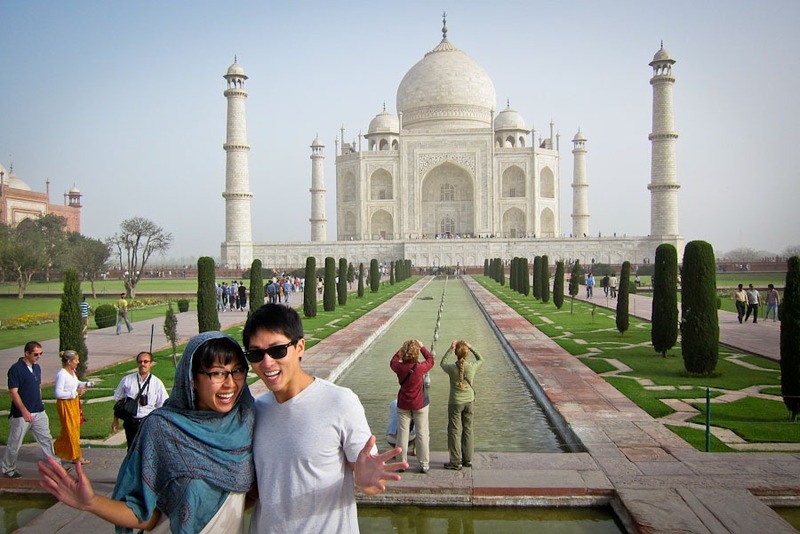 But hey, we lived to tell the tale – we survived India! 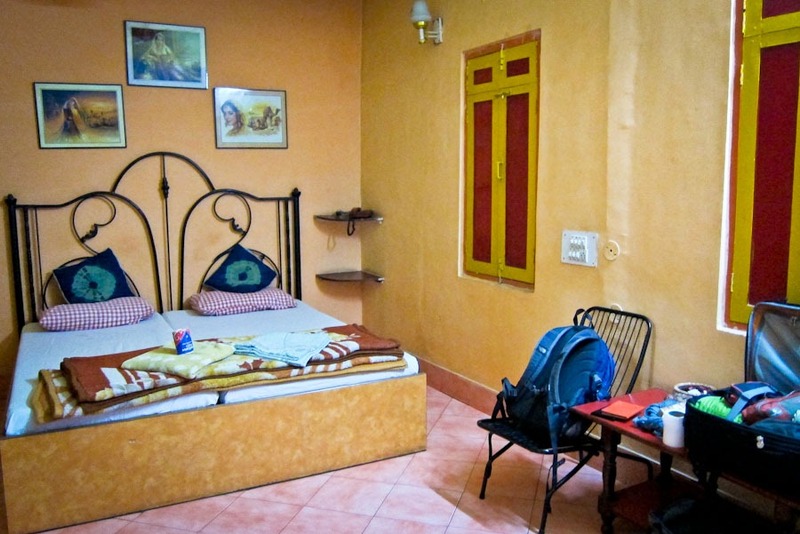 Accommodations: At $25USD per person per day, we traveled and lived comfortably in India. We splurged a bit on our stay opting for private doubles at Guesthouses. The rooms were basic with double bed, ceiling fan and toilet and cold showers. 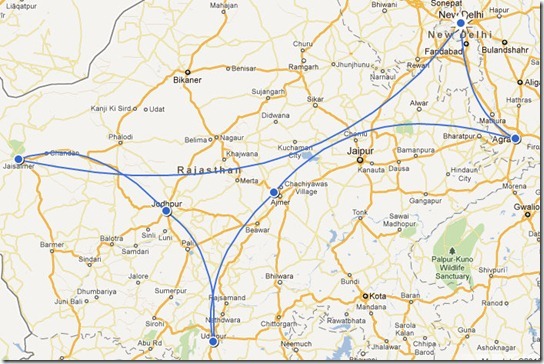 Transport: To get us from one city to the next, we used the Indian train system. 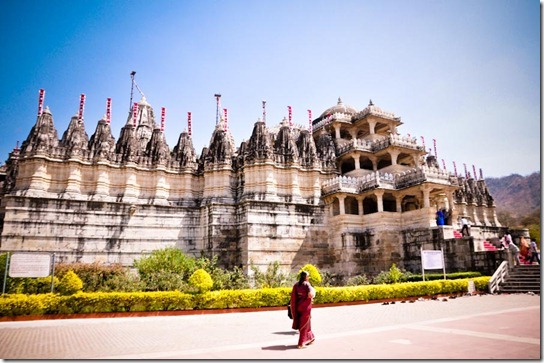 The only exception is when we hired a taxi to take us from Jodhpur to Udaipur with a stop in Ranakpur. Within the city themselves, we’d either walk to most places or bargain for a rickshaw ride. New Delhi has a great metro system but we only used it once or twice. 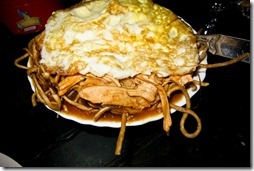 Food: Our first few days, we were paranoid to eat street food in India so we ate at various restaurants that look busy. Usually, we’d split a Thali, traditional Indian meal made up of a selection of various dishes. Also, samosas on the streets as often as we can get it. Activities: Our biggest activities include our 2-day camel safari in the Thar Desert and admission into major sights like Fort Palaces, museums and, of course, the Taj Mahal. # of chapatis eaten: too many! Favorite city: We love the beauty and pace of Udaipur, but Pushkar took us both by surprised because it was a vegan town and straight up hippy, we didn’t think it fit our style.. but it did. I adore the psychedelic blast from the past and crave the fresh fruit salads and vegan pate. Worst city: While I had my best shopping days in New Delhi, it was too congested, polluted and chaotic for our liking. The shop vendors and rickshaw drivers weren’t exactly the friendliest. Favorite part about India: Wandering the streets dodging rickshaws and cows..
Biggest regret: We struggled with our itinerary up until the last few days. But in the end, decided we’d be too crunched on time to try and make it out to Varanasi. 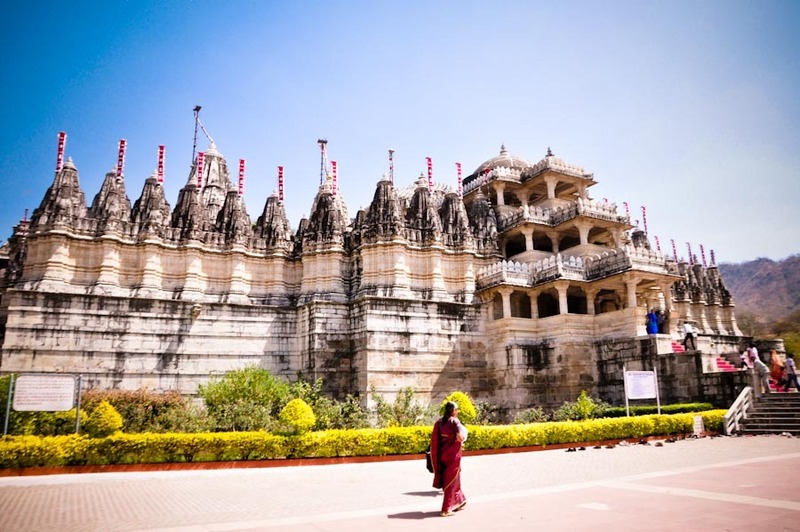 Must see tourist attraction: The Taj Mahal is a given, but if you have time to spare, it’s worth making a stop in Ranakpur to see the Jain Temple. Best new experience: Partaking in a traditional Hindi wedding. We are now officially, wedding crashers! Worst experience: I’d say getting groped during Holi but far worse is getting Delhi belly in Jodhpur. For 4-days, I ate nothing but bananas, vegetable soup and hot lemon-ginger tea. Even after, I couldn’t even smell Indian food without feeling queasy. To this day, I still haven’t had Indian food. Weirdest experience: I had to wrestle a cow in Jaisalmer. Sacred or not, s/he charged at us first. When it doubt, grab ‘em by the horn! 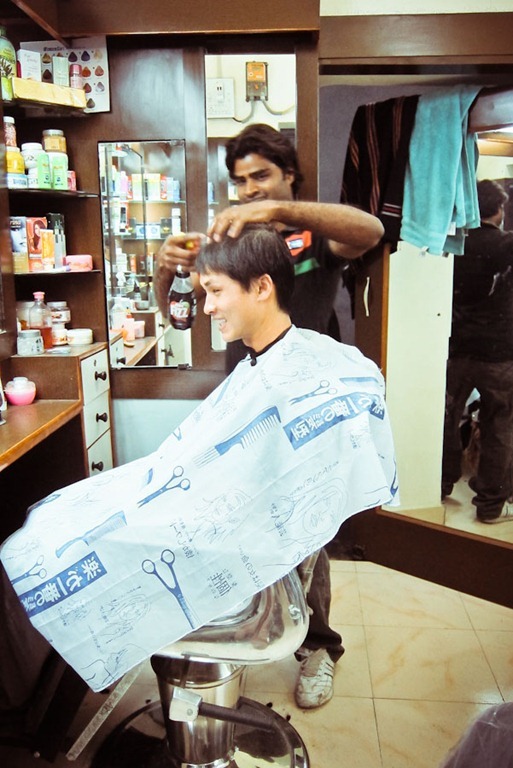 Best deal: Haircuts! 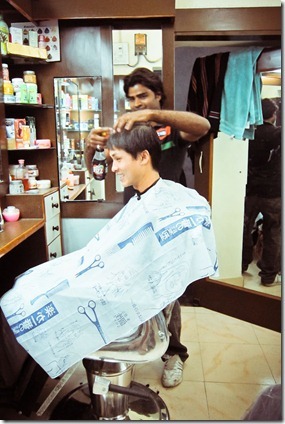 Gerard paid $1 for his stylish due in New Delhi. Biggest rip off: Paying “camera fees” for major attractions on top of your admissions fee. How ridiculous does that sound? Tip: Hide your cameras! What drove me nuts: The spitting. I can’t stand the spitting. Especially when I’m the one getting spat on. Or, being mistaken for Japanese, Chinese or Korean and getting Konichiwa’d wherever we went. Best meal: Our first masala dosa in New Delhi at Sonu Chat House was quite memorable, but hands down the best thing we ate in India was actually not Indian. 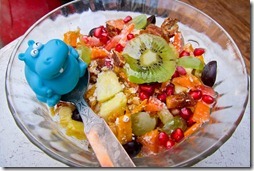 It’s a fruit salad from Sonu Juice Shop and vegan falafels in Pushkar. 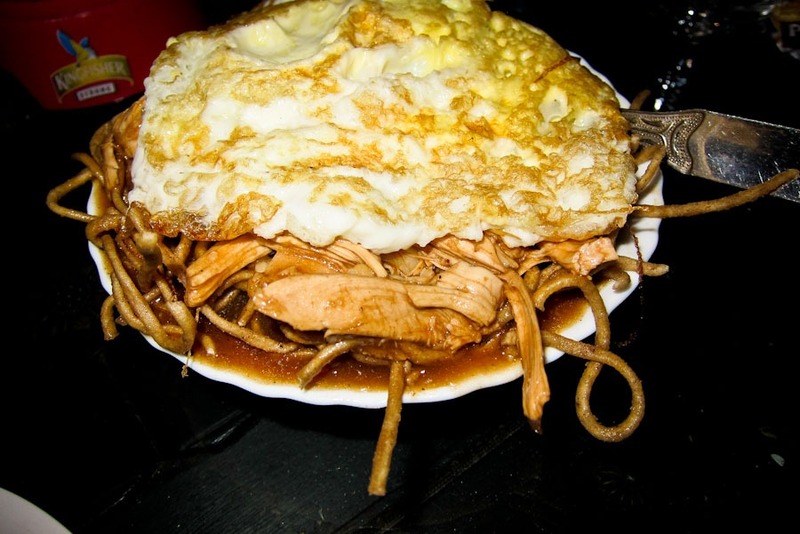 Worst meal/ food: Gerard braved the menu and daringly ordered the American Chop Suey aka Chinese fried noodles with veggies, gravy and a fried egg for dinner. Indo-Chinese.. not sure these two cuisines were not meant to go together. Biggest surprise: That people don’t smell. Seriously though, my biggest fear would be crammed on the train with bad B.O. for 12+ hours. None whatsoever. Biggest accomplishment: Walking and dodging cow poo without looking. HUGE accomplishment! 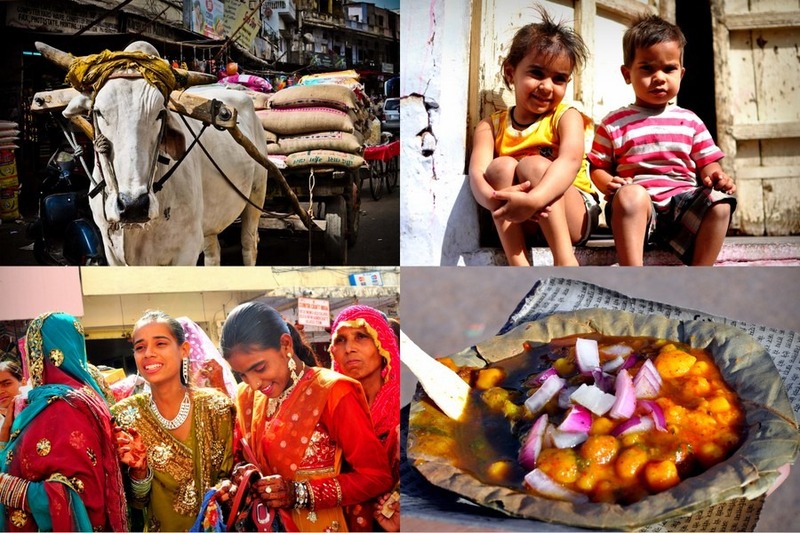 Things we like: Colorful sariis, samosas, street food, Chai tea, Parle G ginger cookies, tomato soup on the train, photogenic, rickshaws, bargain shopping, Pushkar, local children, vegetable soup, Indian weddings, the cows! Things we dislike: Squat toilets, cow poo in the streets, overly sweet desserts, the constant staring, no toilet paper, vendors and hagglers, men sh!^ing out in the open, locals asking us to pay for photos taken of them, spitting. 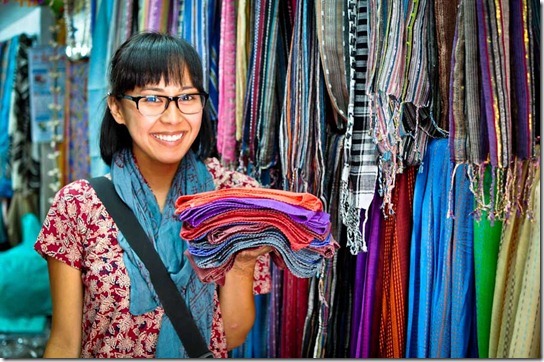 Best souvenir: Indian scarves for 50 rupees! Language lesson: In the Rajasthan region, we managed with 4-words even though everyone speaks English anyway.. they really like and appreciate the effort: atcha = good, bahut atcha = very good (both relating to food), dhanyavad = thank you, and the ever powerful, theek hai = which has endless possibilities when it comes to bargaining! India is one amazing country! It’ll pull you in ways you never thought possible and test your limits. I won’t succumb as far as to clean my behind with my left hand, but I now can eat with my right hand (I’m a lefty), squat on any toilet and shower with cold water. I survived Holi, a tick on my back courtesy of our camel safari in the Thar desert and let’s not forget, Delhi belly, and I still had a blast. Nobody leaves India and calls it a vacation. India is an experience. It’s intense and abrasive and unforgiving. It’s raw. It’s the real deal and everyone should visit at least once in their lifetime. If you want to see more fotos from our time in India, visit our Facebook page! 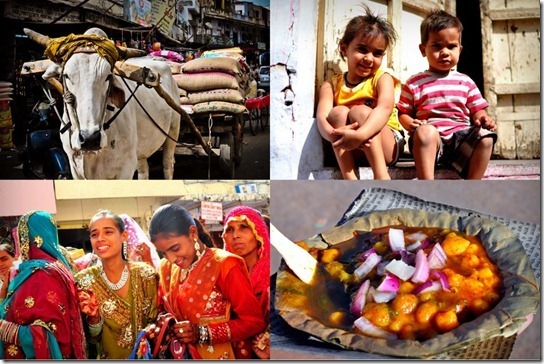 What are some of your favorite memories of India? I love this! I’m so excited to be in India in (hopefully) a few days. Your posts have been so incredibly helpful. We can’t wait to see what we take away from this amazing country. I too loved that line. Will be India in 1 month with no end date! Thank you G & Q for all your useful articles and this cost summary. I think you’ve summed it up nicely that India is both awful and astonishing. In my two months there, I was shocked by how quickly I became accustomed to the poverty. Yet I was never anything less than overwhelmed by its colourful beauty, the architecture and of course the glorious food! It’s definitely a journey, in the truest, most complete sense of the word. Thanks for posting this! I’ve bookmarked it for when I get to India 😉 But it does make me wonder…what did you do if people asked you for money after taking a picture of them? 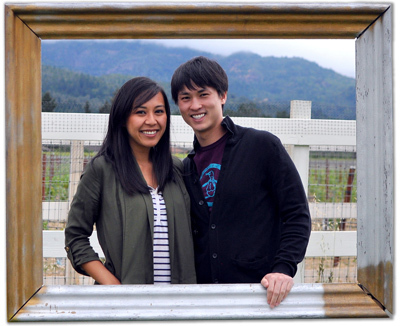 Did you give money, not give money, delete the photo, or just walk away…? I don’t know what I’d do in a situation like that! We walked away.. they’re use to it I guess. Unless they flat out insist we take a photo of them.. that’s a clear sign they want money from you.. in which case we usually refuse. hahaha, your dislike list. seriously impressed with the budget you kept for 21 days! Yea, that part wasn’t fun at all but probably helped with keeping us way under budget! Lol, I barely ate much at all. But it really is cheap.. I now see why people stay for months on end. I love these cost posts. I have to say, I thought India would be slightly cheaper, however still a lot kinder on the savings than Australia or New Zealand! It can be cheaper. You can do India for $15 / day too. We spent a little bit more for comfortable accommodations. This is one country where we didn’t want to mess w/ the sketchy lodging. India is still on my travel list. I also thought it would have been cheaper but good to know it’s still quite manageable. 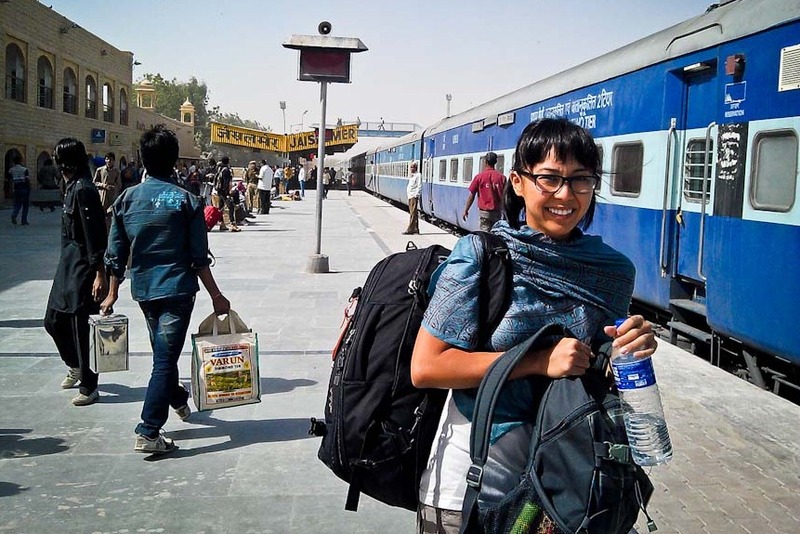 The budget would also vary depending where you are traveling within India. For instance Goa, party land, specially during high season, can get “expensive” (for Indian standards). But it’s still one of the cheaper countries to get around, I think.. These are still my favorite posts. For 50 Rupees I’d buy every dang scarf they had available. I’ve got to do these posts for my Go with Oh trip! Great post! 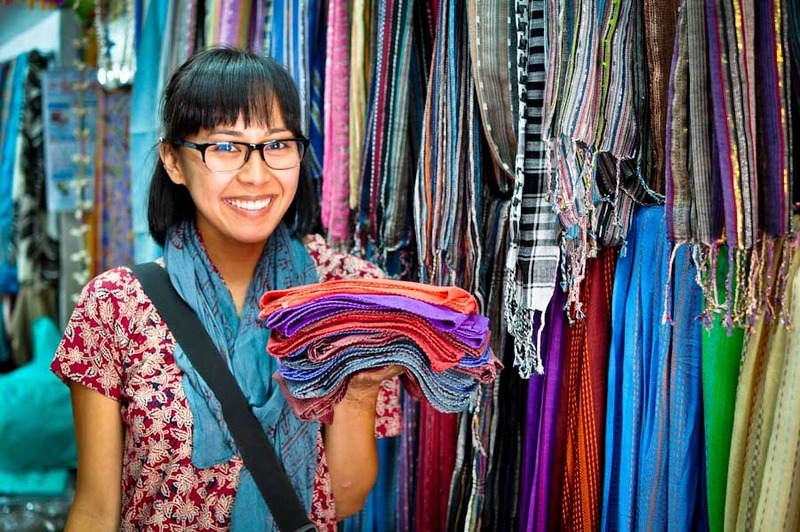 I actually have the scarf you’re wearing and bought a bunch for my friends while in Bangkok, haha. Great tips and breakdown of costs. After South America and Antarctica, India is the next stop on my list! Been wanting to get there forever! You do?! Cool! Antarctica is definitely on my list..
Great round up of the trip with a cost analysis. This is a great resource for those planning a trip to India. 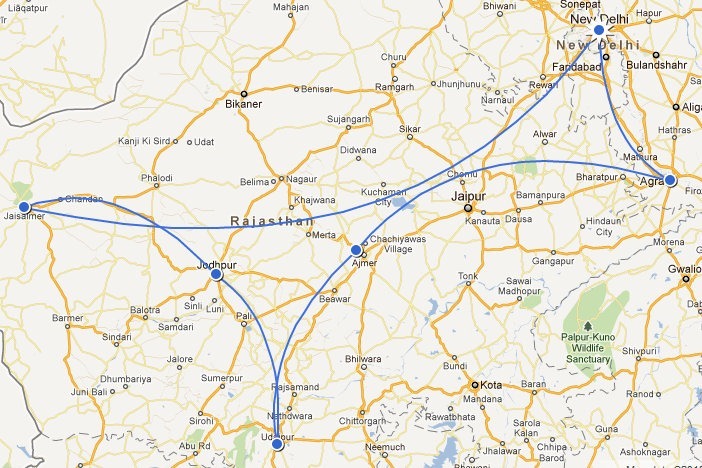 Wow – looks like a jam-packed trip! Fantastic photos too! Great info for India travelers. and scarves!! I don’t travel without those. This is fantastic. Most likely my girlfriend and I will be traveling to India very soon, so thanks for this great planning advice! Awesome breakdown! I wish I knew Pushkar was vegan hippie place with great food. That fruit muesli salad looks amazing. I went thru india trying to avoid most fruit salads, just because I didn’t know if they’d be clean (instead, I’d buy pineapples & cut them up, but that’s laborous). By the end of my stay, I HAD to go Thailand… just to get my fill of fruits. I haven’t quite figured it out yet, but sometimes I wonder if locals do that Konnichiwa thing just to be annoying. Got more of that in Morocco than I did India and it grated on me (even if I am half Japanese). Once you’ve traveled around India, you’re pretty much good to go anywhere else in the world and survive juuust fine! I’d love to go back and explore the South. India is such a large country! I spent 3 weeks in India – even had my own driver for the trip and travelling around with friends…I hated it!! I couldn’t handle seeing all the poverty and kids begging me for money – at some points I was in tears. I had men constantly staring at me and trying to touch me – a few times pulling me to go with them. If you are an attractive young white female, India is not the place to go. Just a warning – ive also been all over the world and its by far, my worst experience. I’ve never been to India, but it’s definitely on my list. I’m a bit scared to admit it’s one of the countries I’m a bit concerned about as I’ll be travelling on my own, but other solo female travellers have done so before me and without incident, so I guess I’ll have to give it a go 😉 Can’t let prejudice and nerves get in my way! On a serious note though, your posts are a tremendous help to me, thank you! glad you like it! Hope you find it helpful or at least somewhat entertaining. Thanks! I am sorry it surprises that we indians don’t smell ..what a relief it must have been to find out that we indians don’t suffer from a chronic condition of BO. phew!